10 tips to a better SINGING AUDITION. We all know how it can go: you sing in front of the mirror beautifully just before you walk out of the house to your audition, (whether it be for your school musical, singing the solo at graduation, or American Idol). Your turn is up to show them what you've got and you don't even recognize yourself. What happened to all that prep? You are a bundle of nerves your voice doesn't feel attached to your body. Your sound is meek, you go on auto-pilot, your vibrato jumps up too many notches, you twitch your face or do strange things with your hands, and your breathing, forget it, you can't get a good breath without gasping to save your life. Any of this ring true? I have experienced it all in my singing days. So what can we do to battle and be victorious over our auditioning experiences? A voice teacher once told me years ago that I should expect my auditions to go behind six months of my current fabulous singing state. So if you've recently changed technique you may not hear it in your auditions for six months or so. This is because our bodies go on a sort of autopilot so we need to have all the right sensations memorized in there and solid so we can automatically reference them. We spend so much time singing to accompaniment by ourselves in our homes and then step out into auditions and expect to deliver. Auditioning itself takes practice. Whether you grab a friend, your kid brother, or your parent’s book club. Sing for people. You need to practice being stared at while you sing! 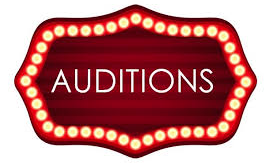 Find auditions in backstage west, craigslist, or a music trade and go as often as you can. If you are serious about getting a certain singing gig than you need to practice the process of getting it before you actually go for it. Do these other auditions as a rehearsal for yourself so your body practices singing on nerves and adrenaline. Each time should get more comfortable. And who knows you may find yourself in a great opportunity as a result. Before your audition remember to take some deep breaths. At least three slow focused deep breaths. Imagine that they are low in your body. When we are nervous our breath and voice tends to get too high and we lose our connections. There are fabulous breathing exercises on my volume 1 CD of Voice Lessons To Go, Vocalize and Breath. Sit and do some in your car before you go in for the audition. Every song has a story in it. Be in the story from the start of the music. Convey your words and emotions. Be the song. This will help to focus you out of the nerves and into the music. Try and sense a heaviness in your body before and during the audition. You want to stay as deep into your body and sound as possible. Imagine you are a tree your feet are the roots buried under the earth and your legs heavy trunks. Any image to help you stay connected to your sound. This will help you to stay on your voice as opposed to singing breathy from nerves. It helps, focus your sound into the center of each word. From the first word imagine you are in the middle of big lines of text. Be friendly and warm from the start. It's always great if we have a minute for a greeting. Use it if you have it. It is good to hear your voice in the room spoken before you open your mouth to sing. It will help relax you and lessen the shock. Go through the audition in your mind step by step, how you want it to turn out, before your get there. A few nights before the audition before you go to sleep see yourself, walk in, introduce yourself and sing through the whole song relaxed and with success. The more your body memorizes these good sensations, the better chance you have at mimicking them on autopilot. Take the nerves and turn them into performance energy. Push them down in your body and use them as a generator for a fabulous performance. Turn the nerves into whatever emotion is appropriate for your performance. I hope this helps! If you have any other great auditioning tips please reply with them!